With these options you can create a beautiful staircase that will be the focal point of your home. We proudly feature L.J. Smith stair parts. From traditional wood rail systems to bold wrought iron, you can visit L.J. Smith Stair Systems to see what is available to help you design your stairway. L.J. 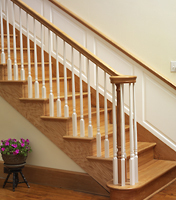 Smith FAQ is an excellent resource for installation of stair parts.